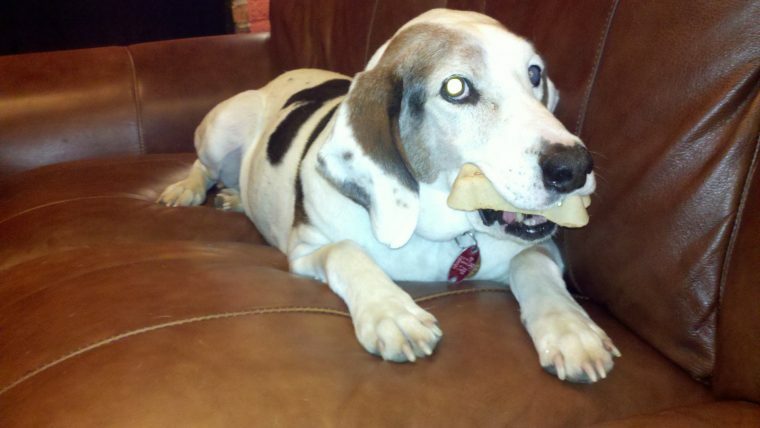 Well, we think maybe our dear Walker Tree Hound, Quincy, …. may have had a stroke yesterday afternoon. He seems to have very little control when he’s walking … as if he’s drunk. He’s had a hard life (up until when we adopted him last year), based on how he acts, we believe he’s spent most of his life outside tied to a tree or doghouse. He’s mostly deaf, blind in one eye, and to make matters worse, we had him neutered when we adopted him from the Humane Society — Poor Boy ..
It’s sad to watch him, he knows there’s a problem and he just can’t seem to figure things out, he’s stopped eating and that’s not good. Our veterinarian is closed on Monday but Kathy will call tomorrow to see what we should do, if anything. Keep us in your prayers, we might be in for a rough ride. Thankfully, Quincy is ok now. Took him to the vet on Tuesday morning and it turns out he had Idiopathic Vestibular Syndrome or “Old Dog Syndrome” which manifests itself as VERTIGO so he was dizzy and nauseated and not eating. Vet said it comes on quickly and fades away about 2 weeks. It’s the 3 day now (Wed night) and he’s nearly back to his old self!